Pretty fun day out in the forest. Didn't notice that #1 was in the wrong spot, nor #9, but taling to others in retrospect, it would seem to be the case. I was able to get myself to the circles pretty cleanly, but messed around a bit while there to find the correct feature. #6 frsutrated me since i never saw the boulder it was meant to be on, and the control was sort-of shoved between the bare rock and a yacka. 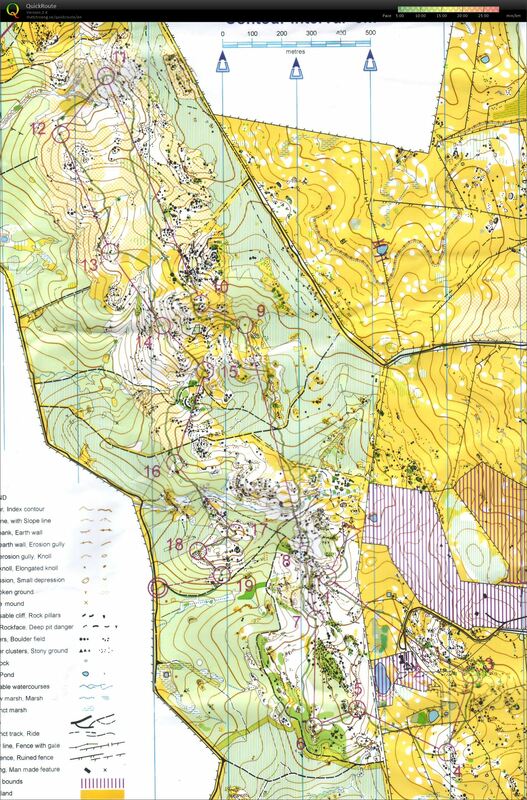 Luckily spiked #9 despite having difficulty understanding the map without accurate vegetation mapped, and what was there didn't make too much sense. Made my first proper navigational error on the way to #10 where i mistook a cluster of rocks as the top of the hill, and missed the saddle i was aiming for. I stopped to help an injured Mel at #16 and got her back on her feet before completing my course. Took a couple of deep breaths after leaving Mel to make sure i didn't do anything silly which paid off. Went back towards where Mel was going to help her up the hill. She was fine, better to keep on your feet with a sprain than not. Pewsey Vale remains to be a good map despite the obvious vegetation flaws due to logging, would love to see it back to it's glory days. It was nice to have a BBQ at the event then follow that up with Lovell's Bakery in Birdwood - they have moved to a nice new building.